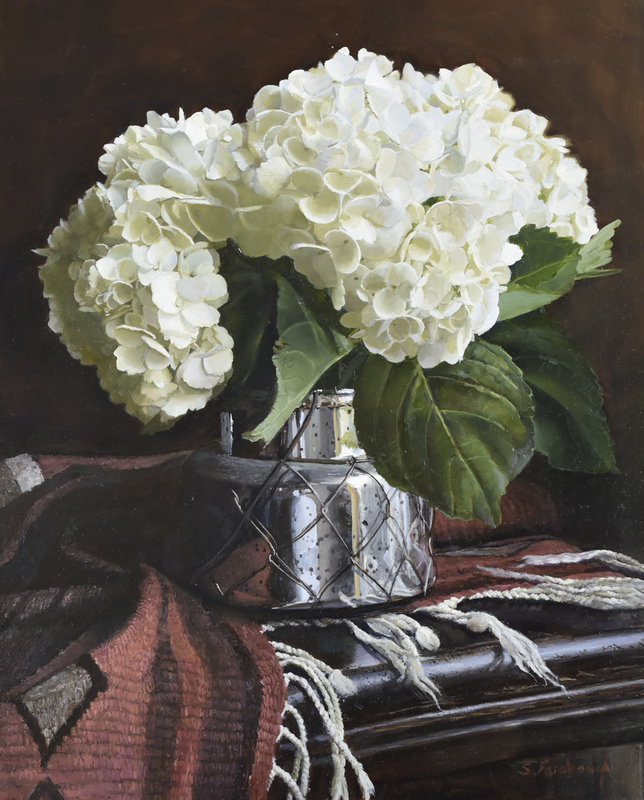 Writer W. James Burns, Ph.D.
Fifty-eight of the most talented Western American women artists will be luring collectors and art lovers from around the globe out Wickenburg way for seven weeks this spring. The 13th Annual “Cowgirl Up! Art from the Other Half of the West” is on view at the Desert Caballeros Western Museum in Wickenburg through May 13, 2018. If you have never experienced this exhibit, you are missing one of Arizona’s art treasures. Cowgirl Up! was created in 2006 as a counterpoint to the all-male Cowboy Artists of America exhibition hosted for decades by the Phoenix Art Museum. 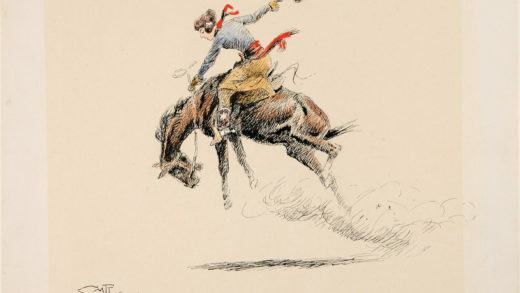 Few venues existed for women Western artists to show and sell their work exclusively. Desert Caballeros Western Museum stepped in to fill the void, and Cowgirl Up! 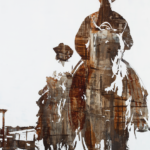 quickly became the most important exhibition in the nation for women Western artists. Cowgirl Up! 2018 provides an opportunity to see an extraordinary selection of Western American art all in one place, at one time. 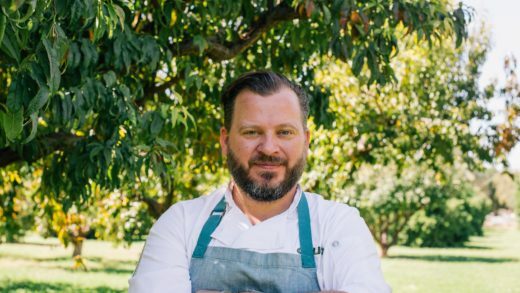 Artists are rotated each year; longtime favorites are comingled with new artists offering ever-changing interpretations of the West. Since its inception, 185 sculptors and painters have been included. Denver-based artist Maura Allen creates stylistically contemporary work such as “Morning Ride,” incorporating traditional subject matter. The intermountain West, a rich source of material for her work, remains home to ranches, rodeos and vintage main streets. She is particularly drawn to ranch families and the way traditions are passed from one generation to the next. Landscapist Jessica Garrett draws inspiration from the environment, and landscapes abound in Cowgirl Up!. Synonymous with the American West, landscapes were not always considered Western art as they are today. One of the youngest-ever Cowgirl Up! 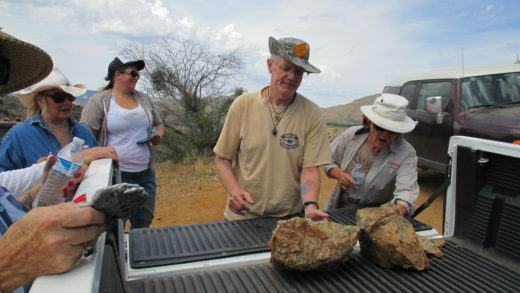 artists, Garrett is an Arizonan who paints throughout the region. She conveys the feeling of the landscape in works such as “Blinding Beauty” using traditional techniques and a fresh emphasis on color. Child prodigy Erin Hanson was painting commissioned works by age 10, and was employed as an artist after school by age 12. Drawn to vistas and natural beauty, Hanson creates one painting a week, frequenting national parks and remote areas to provide source material for her work. “North Canyon” reflects Hanson’s minimalist approach of placing impasto paint strokes without layering, a technique she pioneered that has come to be known as open impressionism. Rhythm and color are integral to her contemporary style. 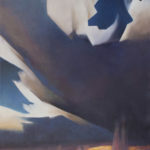 Working in a style similar to Hanson’s, Wisconsin-born Shelby Keefe employs different techniques to depict the built environment in “Yarnell Classic.” The vintage Ford and classic Texaco symbol are ubiquitous to rural communities across the mid-20th century United States, but the distant landscape and cerulean sky are unmistakably Western. Keefe reminds viewers that the West is not all pastoral scenes; she also paints urban landscapes, from neighborhoods to industrial scenes. Longtime portraitist Marcia Molnar prefers to combine styles and techniques, often including the figures or fauna of the West in her work. She creates pieces such as “Rain Dance” from her Prescott studio, clearly influenced by the surrounding environment and nearby ranches. 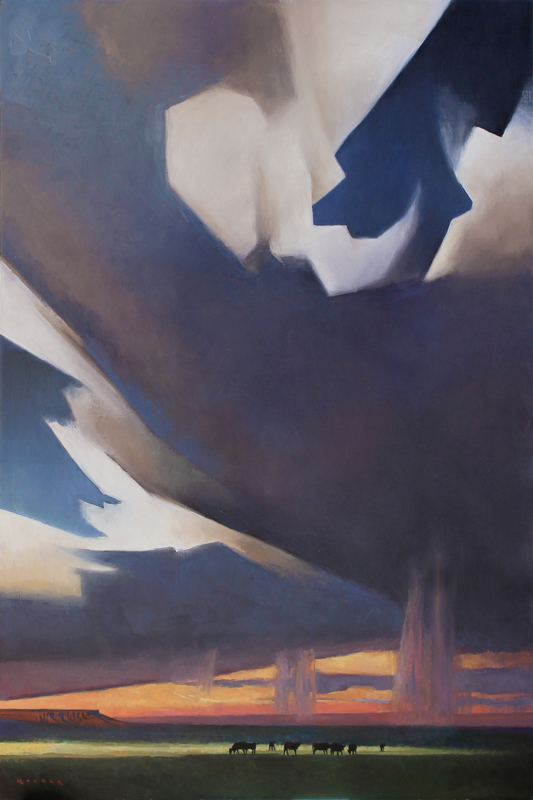 Geometric clouds loom large in the sky that dominates this painting. Will it actually rain, or is this just virga? 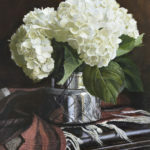 “Hydrangeas” is a classic example of her photo-realistic style; much of Farabaugh’s work is part still life, part landscape. Cowgirl Up! 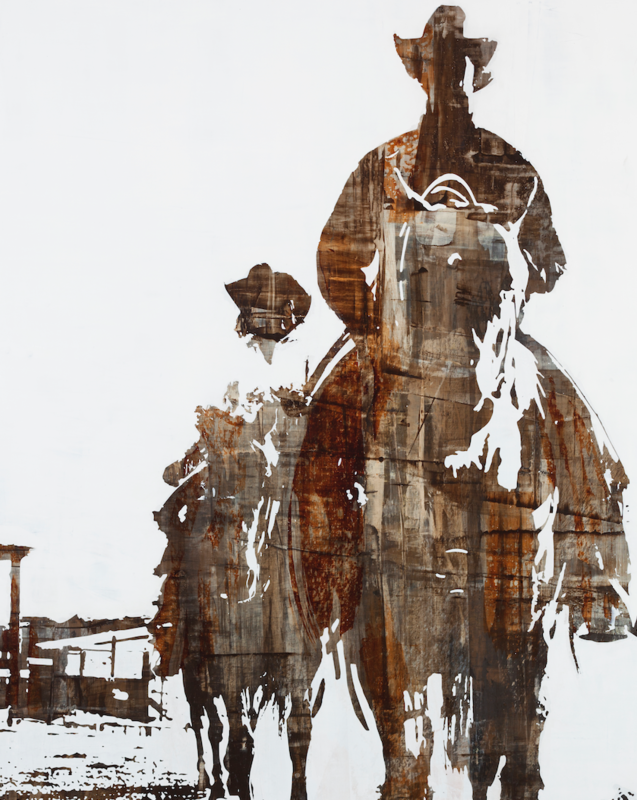 artists utilize contemporary and classic Western iconography to evoke a sense of place; the subject matter and styles of these artists span the spectrum of Western art, expanding our horizons and redefining the genre. Their work adds depth and dimension to the field. More than a sale and exhibition, Cowgirl Up! is an opportunity to publicly recognize the significant contributions of women Western artists to the Western American art world. In a realm dominated by men, these talented women artists have a chance to thrive. Collectors, curators and the public celebrate the many values of their work. Cowgirl Up! helps to right a wrong and to give women Western artists a place alongside their male counterparts. Filling much of the museum, Cowgirl Up! features over 200 works in a Main Gallery, and a Miniatures Gallery, which offers artwork within the financial reach of emerging collectors. Collectors have an opportunity to get to know the artists and visitors periodically encounter some of the artists in the gallery during the course of the exhibition. Cowgirl Up! has become a mindset over the years as the artists, collectors, and patrons have interacted and formed lasting friendships.